Amazon is not wasting time. Speed of execution is at the essence of Amazon’s model. As soon as U.S. regulators approved its acquisition of Whole Foods, it announced that it would aggressively reduce the price of several organic staples in all of the 431 Whole Foods stores in America and Canada. Amazon’s playbook is about low margins and high-volume sales, for anything, including organics. Technically, Whole Foods was in a free fall before its acquisition. Store traffic was shrinking, sales were sluggish and the company was having difficultly convincing shareholders that organic food sales are immune to economic cycles and pose a bright future for the company. Whole Foods reinforced the fact that organics were, for the most part, exclusive and for the elite. Organic groceries can cost consumers almost twice as much as conventional food products. Margins are also a sweet deal for grocers, as they can be as much as 5 times of what it would be for mainstream food products. Amazon obviously knows all this and intends to make organics more affordable, more democratic. At the same time, it also expects to make a statement as a change-agent in groceries, putting everyone on notice. Slumping stock prices for main grocery chains in the U.S. show Amazon certainly has the market’s attention. This is not the first time a giant food retailer attempts to make its mark in organics. 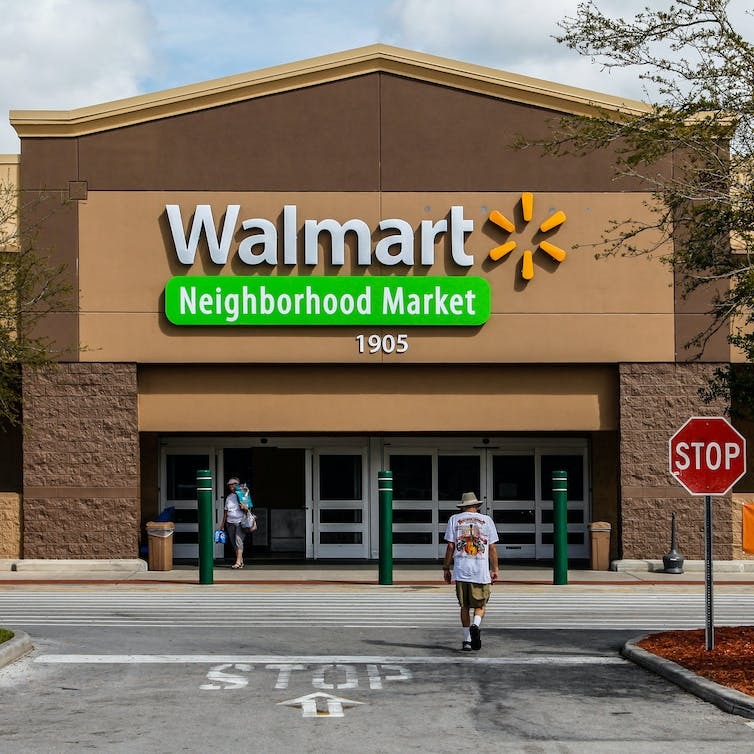 Through its influential logistics, Walmart has made organics more affordable over the last decade or so, however with mixed results. When it committed to organics, Walmart wanted to offer well over 140 different organic products to its customers, but failed miserably. Walmart soon found out that the realities of organic farming make accessibility more challenging. Over the years, it adjusted expectations by offering fewer but cheaper products. Today, Walmart is now the largest seller of organic food products in America. Amazon, on the other hand, has Whole Foods, the Mecca of organic food retailing, giving it a huge advantage over Walmart. By acquiring Whole Foods, Amazon gave itself access to an incredible eco-system which includes well-established organic farms and wholesalers. Unlike Walmart, Amazon can execute its strategy almost instantaneously. And so, it begins, but it remains unclear as to how all this will affect the Canadian organic market. Unlike in the U.S., food prices in Canada have started to rise again in recent months which has given grocers some well-needed breathing room. If anything, we could see organics go up in price due to Amazon’s willingness to make organics more appealing to American consumers. With higher demand south of us, procurement could become more challenging for main Canadian grocers, even if our currency remains strong against the greenback. With time though, as Amazon increases its footprint in Canada, this may all change. The American food distribution landscape is much different, especially these days. With German-based Lidl and Aldi also expanding in the U.S., Americans may witness a continued food price war. Except for July, food prices have dropped for 18 months in a row, the longest stretch since the 1950s. Pricing always has a very direct short-term impact on profitability. Over time though, survivors are the ones able to absorb shocks coming from the competition. Since Amazon has never played the high-profit, high-dividend game, this is a non-issue for the company. But with organics, the Amazon-Whole Foods story will only make matters worse for Kroger and Cie. Convenience, for organics, is the primary factor, price is less so. The physicality of organic retailing coupled with online selling can only leverage Amazon’s position in the market place. The distribution story behind Amazon’s move on Whole Foods makes the online giant almost immune to any procurement challenges which is typical with organics. Amazon’s next move could be with meal kits. For years, grocers have considered food service as an afterthought. Given that some project that the online food service market is likely to increase 15 times faster than the rest of the restaurant business by 2027, some are starting the move. The first one in Canada was Metro. Metro’s brilliant move of purchasing MissFresh this summer is evidence that grocers are starting to see the potential, but it has been slow. Amazon is clearly not as patient. Blue Apron just announced it was reducing its sales force to better calibrate sales with capacity. Several start-ups have emerged and have done well, but no one has proven that the meal kit business can be sustainable for the long term. Many must spend an outrageous amount on marketing and set very high price points for their products. It is easy to see how Amazon can clarify the essence of the meal kit space by using its massive data-driven schemes. Amazon is essentially about merchandizing convenience for all. Organics, meal kits, it’s all about convenience. For years, Walmart mastered the concept of simplicity in a big box store. Amazon is quite frankly hedging against the indolent nature of mankind. And for that, it’s winning. 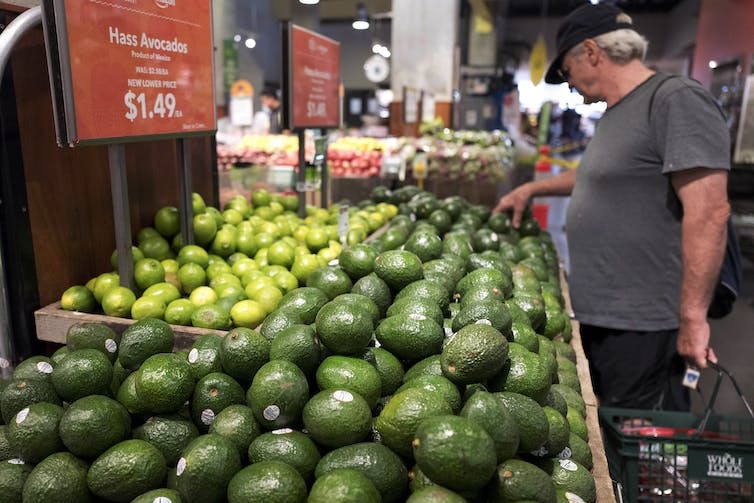 A man shops for avocados at a Whole Foods Market in New York on Aug. 28. The splashy price cuts Amazon made as the new owner of Whole Foods has attracted some curious customers. Outside a Walmart store in Daytona Beach, Fla.